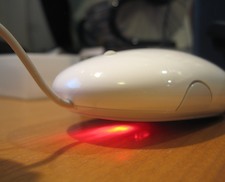 I’m quite a fan of Apple’s Mighty Mouse – I have a few of the wired ones and miss them when I’m on a machine that doesn’t have them. They do have a downside, though, which is that it’s fairly easy for the scrollball to get a bit gunked up, and cleaning it is not trivial. If you suffer from this, you need this page, which has a range of different remedies that have got people out of trouble, and I’ve just added my method to the list. Basically it involves stretching out a piece of Scotch Tape/Sellotape sticky side up and running the ball up and down on it… Not the easiest manouveur, but the results were splendid! Anyway, all of this reminds me of a great story I read many many years ago, in a book about the Atari ST, back when mice were still a novelty, and they still had their balls on their underside… as it were. So you needed a mousemat, and these were also a novelty and rather expensive. The author of the book – whose name I forget, sorry – said that you didn’t need to buy one of these expensive things because wetsuit material worked very well, and he told the story of going into his local watersports supplier, where they normally sold the stuff by the foot or the yard, and asking for a piece about 6 inches square.